The squat little peddler surveyed the road from behind his haphazard table of merchandise like a king gazing over the kingdom from his castle wall. He turned and watched as the girl in the tub roared by in a cloud of dust. The tub compensated for its lack of speed with effort and enthusiasm and the sound of the motor pushed to its limit was deafening. The expression on the peddler’s red face didn’t change, but he watched with interest as the girl drove in a circle around the intersection, scanning the road in each direction, before rumbling back past the peddler on her way towards Hustle River. “So you decided to sell your robot after all, did you?” he called casually after her. The tub had no rubber and was on a dirt road, but was old enough to manage a good screech as it came to a stop. The momentum carried a cloud of dust across the girl’s face, painting her hair a shade lighter as she shot a glance back at the peddler. “What?” she called to him, her voice dangerously low. “I didn’t sell it, what do you mean?” She maneuvered the tub around in the road as she spoke and made her way back to where the peddler stood innocently behind his mobile store. The man’s eyes squeezed into two happy crescent moons as he beamed up at her. “Oh, I’m sure you’ll do quite alright on your own.” The man somehow managed to smile even wider. Kappy wouldn’t have been able to describe a pointed smile, but this man was managing one magnificently. Something boiled up inside Kappy and there was a long moment of silence as the smile and Kappy’s glare did battle with one another. Kappy had enough and grabbed her rifle, leveling it at the peddler. “You are going to tell me where my robot went,” she asked through gritted teeth. “This man is being completely… frustrating!” Kappy shouted. “It’s gone? What do you mean? What happened to it?” said Miles, turning to Kappy in confusion. Kappy looked like she was about to protest, but after a long moment seemed change her mind and instead lowered her rifle and jammed her tub into gear. “I wasn’t actually going to shoot him,” she muttered as she drove off. Miles let out a relieved breath as soon as she was gone and ran his hands through his hair. “I thought we were both going to get shot there for a minute,” he said, smiling at the merchant. Kappy waited at the crossroads next to the sign with the arrow pointing back towards Hustle River. She glared fixedly at the peddler as he talked to Miles, but could hear nothing of what they were saying. Finally, with a wave goodbye to the peddler, Miles made his way to where Kappy was waiting. “He said the robot was in the back of a truck,” explained Miles. “The doors at the back were open which was the only reason he saw. It was a big white truck with two men driving it. They came past maybe two hours ago and headed west.” Miles pointed down along the road. “A big white truck?” asked Kappy. She hopped out of the tub and walked back and forth along the road, examining the dust and tracks. She crouched down looking closely at one set of tread marks and then got back into her tub and started down the road. Kappy glared at him for another moment. She looked as if she was about to say something else, but once again changed her mind. 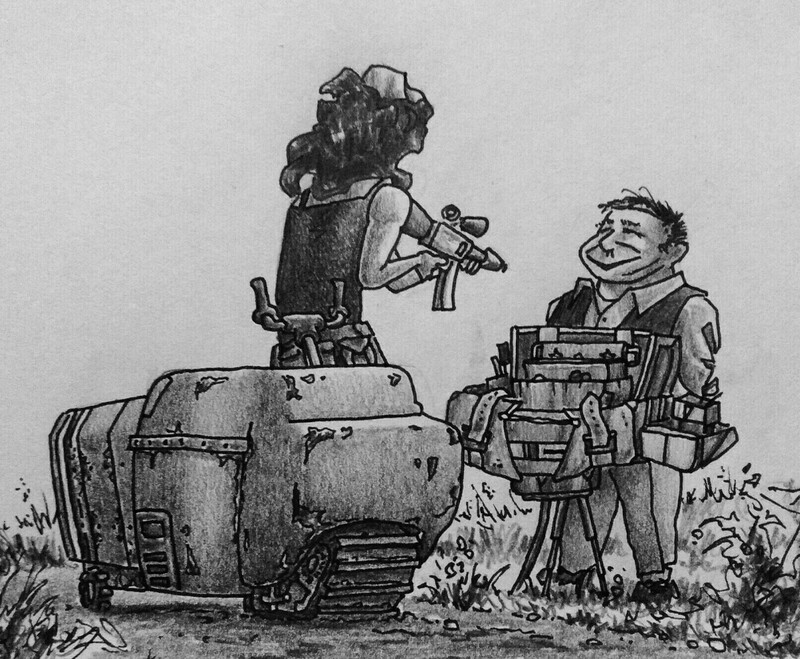 The peddler waited until the two vehicles were out of sight, then lovingly put all his merchandise away, closed drawers, folded, latched, attached and collapsed the table until it once again resembled a backpack, then swung the entire load up onto his shoulders with a grunt. He swung his arms back and forth, patting some of the accumulated dust off his pack and clothes and started off, following the boy and the girl.